Braille Book features awesome exposure, high quality rock and sustained cracks. This is a tough 5.8. Most parties will find this climb substantially harder and more sustained than Nutcracker, especially since it requires off-width climbing. The route is in the shade most of the day and is potentially cold at any time of the year, especially if the wind kicks up. Which SuperTopo guidebooks include a topo for Braille Book? The route winds up the left skyline to the summit. The traditional start is lower on the left. 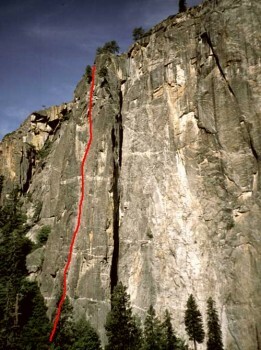 Northeast Buttress of Higher Cathedral is one of the best Grade IV climbs in the Valley.